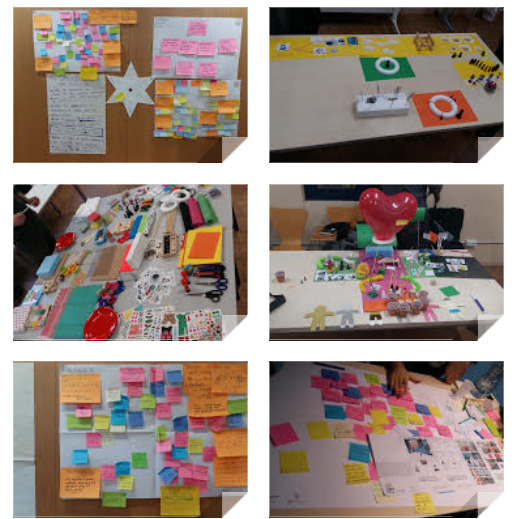 Last Friday I participated in a co-design workshop of the DigitalDIY European project, which was a one-day session organised and facilitated by IDEActivity Center from Politecnico de Milano. The workshop was part of a series of meetings to apply and test new materials and methods for co-reation around DigitalDIY case studies, in this occasion related to organisations and work issues. It represented not only an opportunity to know more about the topic of “do-it-yourself” around autonomous and civic technology-driven projects under the open source philosophy and peer production, but in my case also the chance to observe and take part in a methodology “in progress” as a participant, as it was early explained by the three facilitators of the session. Rather than deepening in the concept of DigitalDIY or the case studies analysed during the session, I summarise here some of the main aspects of the workshop which I consider relevant in the context of design thinking around research processes, which is the topic of my own meta-research project. So the focus of this observations are on methodological and facilitation aspects, the materials used and how at the “meta-level” the conditions for the session addressed key elements of “pop-up teamwork” and shared knowledge generation. The goal was double: for participants to discover more about DigitalDIY principles, in a constructivist way of learn by doing and sharing, and for the organisers to compare and validate the co-design process (according to other previous similar sessions). I think this way of doing was well explained and established and the overall aim was accomplished, first of all by a very transparent and open process of testing a methodology in progress as a “meta-design” itself. There was a series of explorative iterations in the morning, followed by a second round of activities in the afternoon for the co-creation of a DigitalDIY concept based on the previous rounds. That represented a challenge in terms of managing time and the results of each activity to be integrated in the next ones, and in my opinion there were moments at the end where the level of group energy and the intention of a given round of interactions lead to relative low quality results. However the general process was incrementally interesting for both sides (participants and facilitators) resulting in a generative dialogue. I also consider that the general approach of a clear first phase lead by exploration and discovery, and a second generative one of creativity and building together, represents the best way to develop this type of co-creation workshops. Nine participants were divided in two groups, each one working around a specific case study (in our case I chose to join the one around the Public Lab project, one of the most interesting Citizen Science DIY examples I know about). For each group there was a facilitator that worked as a lead co-designer. Sometimes just explaining the steps, eliciting and clarifying when needed, that is, acting as a facilitator. In other occasions pointing to given results, re-interpreting or even focusing on specific ideas from conclusions of the group, which for me was more the role of a lead co-designer. That balance between letting people do and discuss VS influencing by focusing on some of the outcomes was a very interesting thing to see, compared to other co-creation contexts where there’s more room for participants to decide completely autonomous (and sometimes divert) in relation to the main goals. That also led me thinking, in the case of my study, if the same should apply in relation to a researcher as facilitator (in fields like citizen science or action research), not with a “soft” guiding of participants but also at certain critical points influencing and pushing a little bit in one direction or another. The exploratory iterations started by an in deep analysis of a DigitalDIY specific project, presented as a case study on a detailed brochure with its main details: objectives, participants, resources, main values, results, etc. That paper version of what could be found on a website in my group was complemented with sporadic web browsing of the project’s site using a tablet, which for example helped to understand better the project by watching some of its videos. I also think that in this context, the audiovisual language of a video if available could be a better one first to let participants get a general understanding of a new project or case study. And right after that, freely browsing paper or online artefacts could be the additional content to be explored. That exploraiton phase consisted then in locating on a canvas three types of information about the project: people, key enabling factors and main impacts. Guided by a set of cards with questions about more specific aspects of the project, we placed relevant concepts on postits on those three areas while discussing them. Afterwards, a second diagram with the shape of a five-pointed star guided the iteration in order to move there the fundamental elements identified before, clustering the same concepts around them in order to visualize basic patterns of the project. That “extractive movement” from specifics to patterns also seemed a good way of starting to share a language and agreements of what are the main characteristics of DigitalDIY projects. After a lunch break, where all participants from both groups and the facilitators could socialize and relax together for a while, and after an interesting guided visit to La Fabrica del Sol (a fab lab “maker” public space and venue of the workshop), the second part of the day took place in a different room in order to work on the definition of possible new DigitalDIY projects, building on top of our discussions and findings in the morning. That phase was complicated at the beginning in my opinion due to diverse factors: even with a “warm-up” exercise to re-activate ourselves after lunch, the level of energy of the group was low, and the first activity consisted on a guided discussion to extract again common patterns from both case studies, on a new star canvas. That was hard because apart from the facilitators we were all seated in a row in front of the stars, with a feeling probably of certain “déjà vu” repeating the same step but facing a more complex discussion among all of us together. These rounds of putting in common and sharing the insights and process between all participants is a critical aspect of co-design sessions, but apart from kick-off moments they are very delicate and complicated moments, so there should be as “light” as possible, dynamic to the extent people are actively moving around or at least standing-up, managing time in a very agile way to make sure the goal is achieved and attention kept. On the other hand, a really revealing moment and interesting output of that part of the session, once different key elements of DigitalDIY projects were “extracted”, was the comparison with the same results from previous workshops in other places. Coincidences were so similar, and the level of same details from the same patterns identified in a combination of the same case studies, that made me think of how these sequences of iteration conducted in a similar way among different groups of people really make sense also in a more “academic research” environment. That is, something in the comparison of the results from different workshops seems to point to the effectivity and even relevance of co-design also as some sort of experiment process, in terms of scientific relevance. Even given the role of the facilitator as co-designer (at key moments deeply involved in guiding the group discussions), and other amount of uncontrolled variables around each discussion group, in my experience the way we decided and agreed on common patterns (following so many iterations and materials) was a quite open process controlled mainly by all of us. But we reached approximately 80% of the same conclusions around key elements, with similar words, to other groups of people before us that did the same exercises (and without knowing anything about what they did until that “wrap-up” moment in the afternoon). That points probably to interesting elements at some “meta-level” related to collective intelligence dynamics. After that final abstraction (or “extraction”) of common patterns between both case studies, that took approximately 70% of the workshop time, we kept the same distribution (participants seating, facilitators in front of us, maybe too much remembering a “classroom setting”) for a guided discussion about what are current challenges in terms of work and organizations, where the patterns previously identified about DigitalDIY could contribute or represent an improvement. For me it was a little bit strange to see nearly for the first time, after one morning and part of the afternoon, the concepts of work and organisations explicited nearly for the first time. At least in my group, but even in the previous moment of sharing results in common altogether, there was no single occasion when that key element or focus of the workshop was very much addressed or explicit. Even knowing in advance (and during the kick-off presentation mentioned) that the workshop will focus on that topic, I realised close to the end of it that the time finally given to deepen in that area was not really that much. Once we generated and discussed a list of challenges we considered important, and “voted” in a dotmocracy style the most interesting ones for each participant, the final part of the workshop consisted in both groups working separately again, this time to discuss the best approach to finally co-design something together. The big table full of stickers, colour clays, tokens, markers and all sort of materials for 3D prototyping was next to us, waiting to be used since we arrived after lunch. That represented a very nice motivational setting, but also in some cases (at least for me), also causing some anxiety because time was running out. That makes me think and recall all those workshops where as a facilitator I have confronted how difficult is to plan but also to manage timeslots for each iteration. But if the aim is to co-design something together, is important to make sure on the overall planning that there will be a relevant amount of energy and time to “build things”, otherwise the scope is more co-research or co-exploration (very important and relevant, though, but not co-design or co-creation in action). This last part of the session is where I think all of the previous complexities I mentioned leaded to a too much express co-creation iteration, which maybe could have been more relaxed and fruitful if taking a longer. After all, one hour just flies, and it took again a too much guided discussion in my opinion before we could touch the materials and start to “talk with our hands”, building meaning from chaos and reflecting a 3D version of how we understood and answer to the chosen challenge. Again, I know is not easy at all to build in just some hours a shared language and make sure we agree on what to do (between a small group of strangers that have to work together for a while) and then create something out of discussion, around new and tricky concepts. But co-design needs also its time, and is like if we missed maybe one more hour to really take it slow and enjoy that final part of the process. On the other hand, it was however a nice celebration and intense moment, like usually, where people also relaxed without focusing on the issue at the same time. The final round of four minutes presentations, for each of the two prototypes, was in my opinion revealing and fun, but both rapid co-designs were not showing at some parts a deep relation to the long list of concepts and elements we were managing all the time in the previous activities. Among other positive things and interesting leanings of this approximately 8-hours workshop, was to confirm the level of empathy and good mood that a small group of participants can achieve (more difficult when in other scales participants are count on dozens) if they kept as a group for the whole day; the simplicity and beauty of open-ended canvas, which in the explorative and extractive phases consisted in spiral shapes interconnected and a big 5-point star; the use of indiscriminated colours for post-it ntes but different sizes when giving titles to clusters; the guided dedication of a facilitator per each group, with a third one supervising and controlling the overall session (which points to the importance of resources and training for those critical roles); the use of cards to guide questions, recalling the modus operandi of board games.